Welcome to The University College Hospital (UCH) Education Centre, the UK's most advanced medical training and clinical teaching facility. Opened late 2008, The Education Centre's premium facilities provide opportunities for healthcare professionals at every level to learn, enhance and optimise their clinical skills and medical knowledge through experiential learning. Whether the aim is to demonstrate pioneering surgical techniques, master minimal access procedures or simply improve routine clinical practice and patient management, we deliver the highest standards of preparation and continuing medical education using leading-edge technologies and methods. The new UCH Education Centre was designed specifically to meet today's medical training needs, providing a world-class facility for healthcare professionals to develop knowledge, competency and proficiency. The new Learning Hospital comprising the range of innovative clinical training suites at The UCH Education Centre combines state-of-the-art technology and progressive teaching to meet the exacting needs of today's hospitals and Primary Care Organisations. 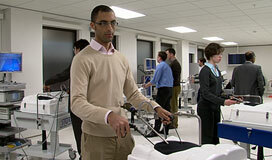 As a benefit of this unique collection of training resources, The Learning Hospital runs masterclasses giving clinicians the opportunity to share expertise with groups of colleagues and students through live demonstrations. In addition to the unique collection of clinical training suites, we have a brand new Conference Centre offering a range of adaptable, high-tech teaching rooms bespoke for behavioural learning and meetings. 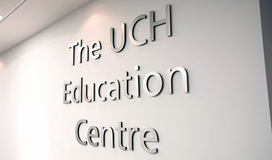 Up-to-the-minute live audio-visual feeds from UCH's operating theatres, interactive display resources in the adjoining Narrative Centre and flexible catering options, plus a location minutes from several mainline London rail stations, make it the ideal venue for national and international events. "The UCH Education Centre was built from my experience of the need for training to be fit for purpose, just-in-time, practical and grounded - based primarily on experiential learning. 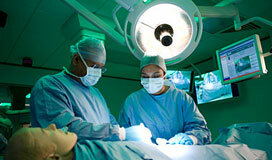 We ask the same question of everything we do: How will this benefit the patient experience? 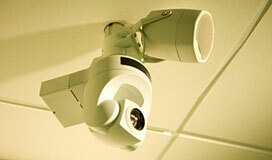 There is currently no other set up in the country to match it."